The first step in a shoulder examination is clinically evaluating a patient with shoulder pain or dysfunction. We start by taking a full and complete history of the complaint. The next step is a clinical examination, with inspection and palpation of the painful area, ROM testing, orthopedic testing, functional testing, and finally decide whether or not to order imaging studies. A thorough history is the first step in establishing a differential diagnosis for a patient with a shoulder complaint. Rotator cuff pain is often described as a dull ache of insidious onset, extending over the lateral arm and shoulder. Overhand activities exacerbate the pain, and the pain frequently increases at night and may awaken the patient from sleep. Weakness with the inability to abduct and elevate the affected arm is seen in more advanced cases; most common functional losses patients complain of are inability to comb their hair, hold a hair dryer, or removing a wallet from the back pocket. Examination should start with the cervical spine / upper thoracic spine because it is often a source of referral to the shoulder. Next an inspection of the shoulder joint should be done for symmetry, and edema. Also inspection of the shoulder girdle musculature often shows muscle atrophy. The supraspinatus and infraspinatus usually show significant atrophy in advanced tears. Visual inspection of the scapula-thoracic joint should be done and any deformity should be documented. Palpation should be performed after the inspection. The arthritic acromio-clavicular (AC) joint is a frequent source of shoulder pain and will manifest as point tenderness inside the joint. Bicipital tendonitis can be detected with palpation over the anterior region of the shoulder, with the arm positioned in slight internal rotation. The greater tuberosity may be tender to palpation, due to bursitis often observed in conjunction with rotator cuff pathology and calcific tendonitis, and can be palpated by extending the humerus. 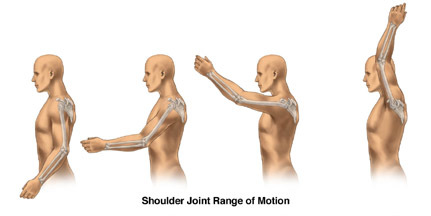 Range of motion (ROM) is checked after palpation of the shoulder. ROM should first be done actively by the patient, then passively by the clinician, followed by resisted by the clinician. It is always best to test the uninvolved shoulder first to get a baseline of what the normal ROM is for the patient. Greater passive ROM than active, with a painful arc between 60 degrees and 120 degrees of abduction, is common in rotator cuff disease. Global decrease in all ROM is suggestive of adhesive capsulitis and osteoarthritis. Orthopedic assessment of the shoulder should be performed next in the initial evaluation. Orthopedic tests for anterior instability of the shoulder include: load and shift test, and the apprehension test. The load and shift test can also be used to check for posterior instability. The push-pull test can also be used to test for posterior instability. If inferior instability is suspected a sulcus sign will be present. Common impingement tests are Neer test, Hawkins-Kennedy test, and the posterior internal impingement test. If the labrum is the suspected tissue of origin it could be a bankart lesion, in which the anterior inferior labrum is torn, or the superior labrum may have been injured, causing a superior labrum, anterior and posterior tear (SLAP). To check for this the clunk test or the O’brien test can be used. Scapular stability can be checked using the four point rock maneuver, or the push-up test. To test for muscle or tendon pathology Speed’s test and Yergason’s test are used for the biceps tendon. The rotator cuff can be tested using the Codman’s drop arm, empty can test, abrasion sign, lift-off sign, and Apley’s Scratch test. Pectoralis major and minor tightness should also be checked at this time. The final step in the shoulder examination process is functional evaluation of the shoulder, neck, and upper thoracic spine. If you are experiencing shoulder pain and unsure what to do next call our office at 317-228-9701 for a free no obligation consultation to discuss your pain and go over your options. For your peace of mind we have taken the Chiro-Trust.org "pledge" to continue to offer mainstream, convenient, and affordable care.